Monday April 21st 1924 I was busy in my part of the house most of forenoon. Cora took Mrs Sheldrick to 1.30 car. I rode to town and walked back. Fannie came up awhile. Rob & Cora to a supper party. Hattie and I spent the evening with Fannie. Cold. 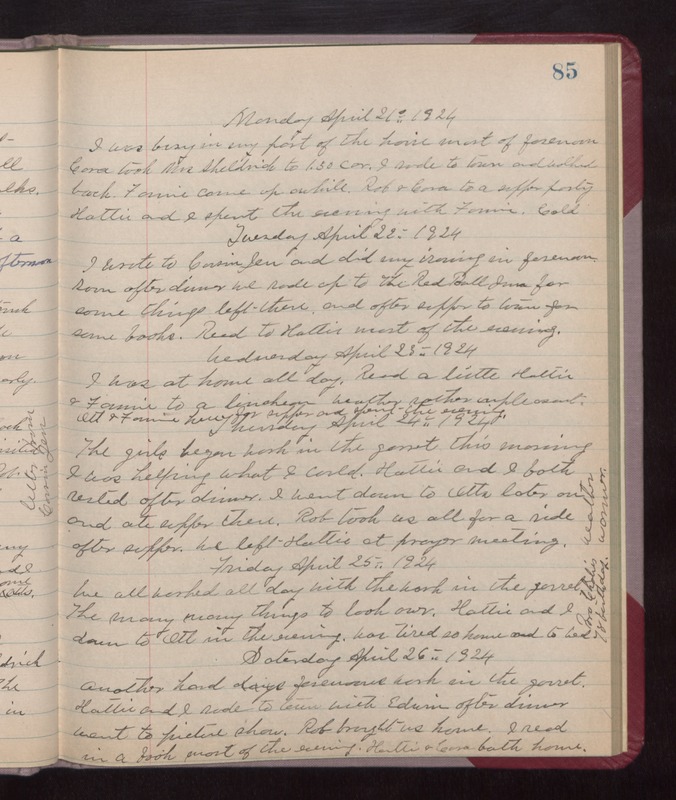 Tuesday April 22nd 1924 I wrote to Cousin Jen and did my ironing in forenoon. Soon after dinner we rode up to The Red Ball Inn for some things left there and after supper to town for some books. Read to Hattie most of the evening. Wednesday April 23rd 1924 I was at home all day. Read a little Hattie & Fannie to a luncheon. Weather unpleasant. Ott & Fannie here for supper and spent the evening. Thursday April 24th 1924 The girls began work in the garret this morning. I was helping what I could. Hattie and I both rested after dinner. I went down to Otts later on and ate supper there. Rob took us all for a ride after supper. We left Hattie at prayer meeting. weather warmer. Friday April 25th 1924 We all worked all day with the work in the garret. The many many things to look over. Hattie and I down to Otts in the evening. Was tired so home and to bed. Bro Charlies 78 birthday. Saturday April 26th 1924 Another hard forenoon work in the garret. Hattie and I rode to town with Edwin after dinner. Went to picture show. Rob brought us home. I read in a book most of the evening. Hattie & Cora both home.